With the 2008 Quiksilver Pro Gold Coast rapidly approaching to kick-off this year’s Mens ASP Tour, all attention will be squarely directed at Coolangata in anticipation of who will come out up on top and thus take the pole-position in the what is setting up to be one of the most highly-charged and competitive tours to date. Just how crucial is it going to be to stand up on the podium and receive an over-sized cardboard check following this event? The last two world-champions(Slater ‘06/Fanning’07) have both started their title-runs with victories at the season-opener. 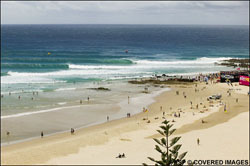 Formerly an ASP WQS 6-star venue, Quiksilver launched their initial Quiksilver Pro ASP World Tour event at Snapper Rocks in 2002. In that time, Slater is the only event-winner to hail from outside of Australia. His victory came at nearby Duranbah after a finals battle with Taj Burrow in three-foot surf. With half of the top 10 seeded surfers on Tour residing in the land down under and the ‘Coolie Kids’ holding a solid ‘home-break’ advantage, it’s going to be super important for any surfer that holds high hopes of taking home surfings crown at years end to start their 2008 campaign off in impressive fashion. Will a poor showing at the Pro Gold Coast kill the chances of title hopefuls? With the best ‘9 of 11′ results format that the ASP is using to decide this years champ, a bad result here certainly isn’t going to dash any visions of being carried up the beach and showered with goodies, flowers, and champagne. It will just put an unnecessary element of added pressure to let it fly at the Rip Curl Pro at Bells Beach which follows a few weeks later, which itself has shown the likelihood of an eventual top 5 finish at the end of the year for the events most recent winners. With as deep and talented a pool as the ASP has ever fielded chomping at the bit and raring to go, anything less than a top 5 result in, at the very least, one of the two Aussie’ events may be prove to be just too big of a mountain to climb as the Tour moves on. For anyone, especially outside of Kelly, A.I.,and the Australian contingent, who plans on coming out of Australia with any dreams of capturing the title, this weekends Quiksilver Pro Gold Coast definitely needs to be the intended site of their coming-out party.